I know that it's an extreme long shot, but is there any footage/audio of Ray's remarks? If we take this report at face value, then we might recall that Ray Wise was proven correct about season 3 being in the works. If the business and creative sides are in talks with one another, here's hoping that they arrive at a mutually satisfactory agreement. Let's also hope that this hypothetical continuation would feature a bigger role for Ray Rise. Ray almost seemed like he was grounded during season three for opening his big mouth about it beforehand. I'm also baffled that he wasn't in season 3 more. It makes a bit of a difference, because Ray doesn't actually say that the parties are talking (though that doesn't mean that aren't), but rather that they're "thinking". So I was checking out Instagram stories and while scrolling through the stories, I came across the official Twin Peaks account. So since Festival of Disruption is going on, George Griffith has taken over Twin Peaks's Instagram account. George had a live video stream going on and one of the viewers asked him "Is there going to be a Season 4??????" to which he replied by taking a pause , looking away from the camera , thinking what to say and he finally says , "I can't talk about it right now". Sounds like there’s gonna be a announcement in 2 months. I'm not at all saying that a 4th season won't happen. In fact, I lean a bit more towards thinking that it will happen. I'm just a stickler for getting quotes right, and I try to be as cool and objective in my interpretations as I'm able. We're three months away from nothing materializing in July from Kimmy's cryptic statement. Even if something is going to be announced, I think that we'll be well served by being very patient. I'm a stickler too. But I did not read the second mention as being about a fan event, nor do I think Sabrina would crack the whip so clearly if it was all that innocuous. The wait for news has really taught me something about bias. 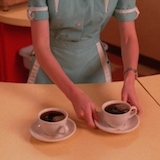 I've read various quotes, as have we all, and my first thought has always been "this must mean more Twin Peaks!". Then the second or third reading makes the quote seem totally innocuous. I remain convinced that it is in the works though. I can't shake that feeling.